The San Francisco 49ers home opener is Sunday, when they host the Detroit Lions. Quarterback Jimmy Garoppolo will make his Bay Area debut and the team is giving out bobbleheads in honor of the occasion. Below is how 49ers tickets prices stack up on the secondary market across the league. 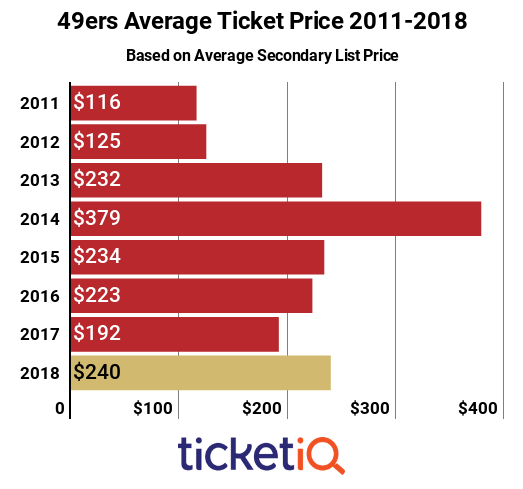 As you can see below, 2018 San Francisco 49ers tickets are up about 20% compared to last season, and are the second most expensive since 2011, when secondary ticket marketplace TicketIQ.com began tracking data. The most expensive ticket of the decade was in 2013, one season after the Niners won the Super Bowl. Tickets peaked at an average asking price of $379 on the secondary market and San Francisco advanced to the NFC Championship that season. With a $241 average asking price, 49ers tickets are ranked No. 9 in terms of price across the NFL. The Patriots are ranked No. 1, with a $501 average asking price. 49ers season tickets are available through the team. Single-game tickets are available through the team's primary market vendor, Ticketmaster, though most are resale tickets provided by the team. There do not appear to be primary market single-game tickets available for any game. 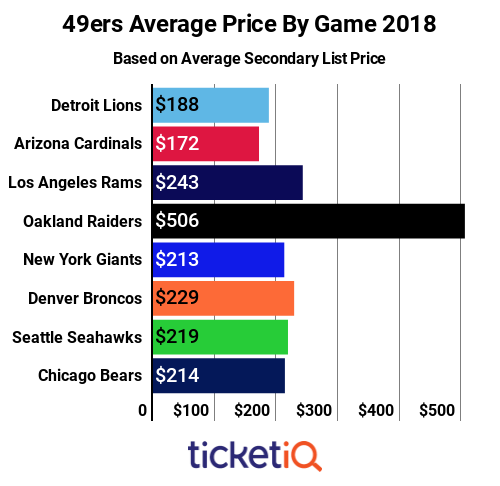 Other than the "Battle of the Bay" on November 1, during which the 49ers will host the Oakland Raiders on Thursday Night Football, the average asking price for secondary market tickets, according to TicketIQ.com, ranges from $172-$243. In addition, tickets throughout the stadium are available for all games through TicketIQ.com, including many with the company’s Low Price Guarantee. It's no surprise that the Battle of the Bay is the priciest ticket of the season -- it's likely the last game between the 49ers and Raiders before the Raiders move to Las Vegas. The game dates to 1970 and the teams have met 13 times, with the Raiders holding a 7-6 series advantage. The teams last played in 2014, when the Raiders won 24-13, at O.Co Coliseum. Both teams started the season with a loss, but with the Raiders impending move, expect the current $506 average asking price to rise.